Analyze the quality and feasibility of your design with respect to the fibre C technology. Manage and Track the fibre C panels production process by accessing up-to-date production information from Rieder directly via the fibre C plug-in. 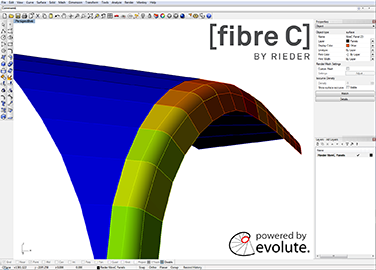 Evolute is looking forward to seeing you at the Rieder booth of the BAU building trade exposition 2011 in Munich and giving you a demo of the fibre C plugin prototype. Looking for a challenge? Evolute is hiring! Are you interested to join Evolute in their fascinating endeavor to revolutionize free-form architecture? Check out the job offers.